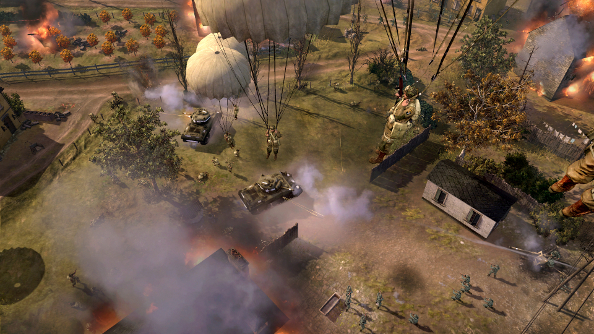 Company of Heroes 2 had big, muddy, army issue boots to fill in 2013, and its Eastern Front campaign managed to be a worthy successor to Relic’s original World War 2 RTS. Since then, players have spent over 40 million hours fighting across Europe and Russia; that’s over 400 years. But with competition from competitive RTS games like StarCraft 2 and the neverending hordes of MOBAs, how does it stay healthy? Plenty of exercise and a good diet? I had a chat with executive producer Greg Wilson to find out what Relic’s been doing to keep people invested in the war. 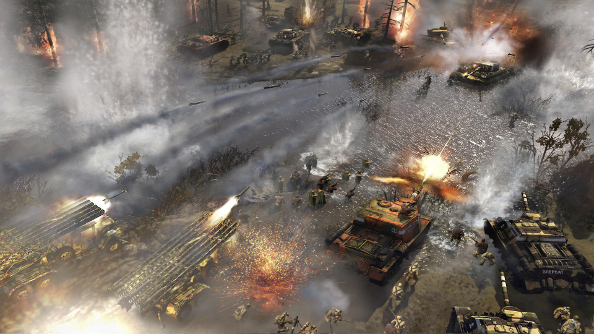 Since releasing Company of Heroes 2 in June, 2013, Relic’s been busy. 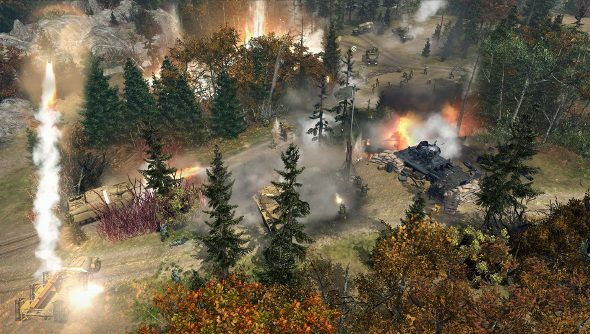 The studio’s been tweaking the core game, fattening it up with new features, and last year released two chunky expandalones, Western Front Armies and Ardennes Assault. Player numbers are on the rise, and it’s the healthiest it’s been since July, 2013, just after the game launched. Wilson lists the “player types” and they’re a varied bunch. PvPers, people who just want to experience the campaign, casters, groups of co-op buddies. With a growing community with different tastes, Relic has attempted to cater to them all by putting out two broadly different expansions. 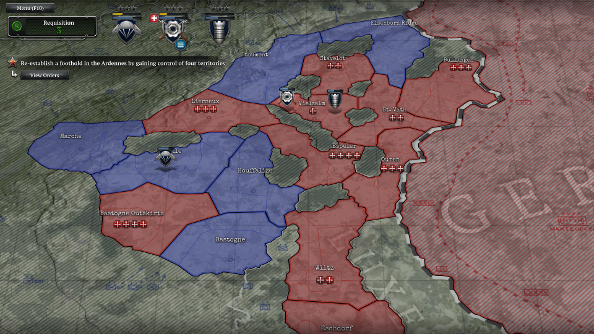 There’s Ardennes Assault, a sandbox campaign spread out across a meta map, filled with dynamic missions; and there’s Western Front Armies, which was dedicated entirely to multiplayer. I wondered if the attention given to the multiplayer has encouraged more people to stick around, duking it out over once idyllic European villages and frozen Russian cities. But it’s not just about keeping co-op and PvP players happy; it’s about trying out new things. 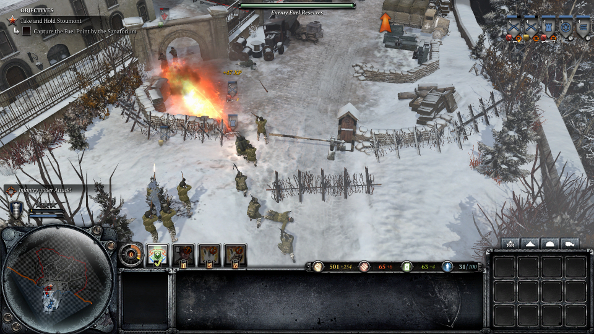 I called Ardennes Assault the best Company of Heroes 2 has ever been when I reviewed it last year. Everything great about the series was there, but with another strategic layer, and for once, the possibility to lose battles but win the war. Both expansions are dramatically different from their forbearer, so much so that it seems like a shift in design philosophy, away from scripted campaigns, has occurred at Relic. But rather than a shift, Wilson says that the studio is just expanding its repertoire. The Western Front is safer, too. 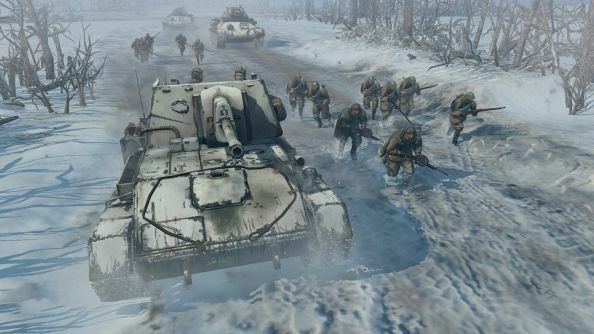 Company of Heroes 2’s campaign attempted to dramatise the harsh “reality” of the war on the Eastern Front, complete with Russian officers murdering their own troops. It was divisive, and didn’t go down particularly well in Russia, but it was an interesting change in tone from the traditional, heroic, good versus evil of the original Company of Heroes campaign. With the two expandalones, Relic went back west, though. While Ardennes Assault was lighter on story than the core game, Relic used the officers of the various player-commanded companies to give the US Forces a human face, and nameless soldiers continue to shout over the din of battle, sometimes crying out warnings or orders, or sometimes just out of fear. Now that we’re in the era of eSports and casting, with tournaments drawing massive crowds, both online and in person, and even bigger prize pools, the way a lot of players are consuming games is through watching others play – competitively or just for a lark. That’s not gone unnoticed at Relic, and the studio’s already been arranging tournaments, and more are coming. “There’s an ongoing relationship we’ve established with the ESL, and we’ll be working – this year – to create a tournament,” Wilson tells me. 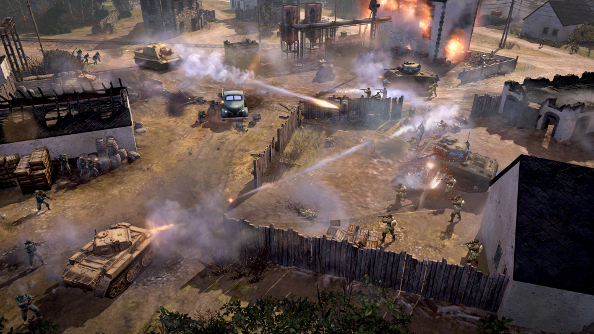 “Look for big things from Company of Heroes 2 and ESL partnership in 2015. Company of Heroes 2 isn’t typical of an eSports game, with its slow, methodical pacing with sieges, and men huddling beneath cover. Wilson thinks that’s part of the appeal, though. He says that it helps that it’s not just about actions-per-minute, which makes it more accessible. 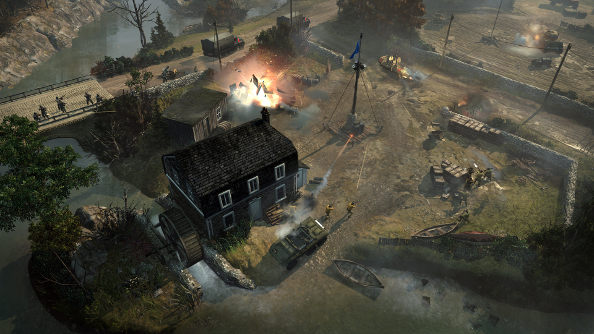 Accessibility seems to be the key word in why Relic thinks that Company of Heroes 2 can succeed as an eSport title, and why Wilson hopes that it could become a core aspect of the series. Battles are easy to understand, not just because they aren’t about rapidly firing off attacks and abilities and sprinting around maps, but because the units are easier to understand. When there are no tournaments running, there are always casters. Wilson notes that there are casters who daily feeds when they’re playing through the campaign or skirmishes, while others might cast top-rank matches from observer mode. I pestered Relic for a few notable casters that you’re bound to catch playing and streaming, if you lovely folk wanted to dip in, but haven’t known where to look. I was told to check out Imperial Dane (YouTube/Twitch), Romeo (YouTube/Twitch) and GeneralsGentleman (YouTube/Twitch).